The modern Langstroth hive has revolutionized the beekeeping world and is by far the most successful hive design on the planet. 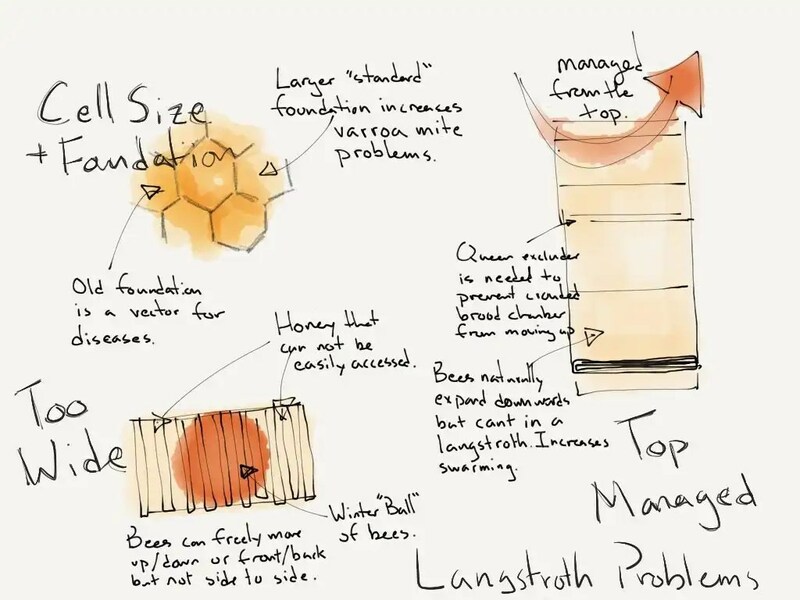 Langstroth’s discovery of bee-space and the creation of the movable frame was such a game changer than it single-handily enabled the commercial beekeeping industry that we see today. Unfortunately, some aspects of the design benefit the keeper more than the bee. In some ways, it appears as though honeybee behavior was a secondary thought. Here are 5 common hive problems and how to fix them. According to Micheal Bush’s excellent blog and book, the cell size of standard foundation is larger (5.4mm) than what the bees would naturally build (4.9mm). At one time, it was believed that larger cell size would yield larger and more productive bees. Unfortunately, there’s a parasitic mite (Varroa destructor) that breeds inside these capped cells while the bees are pupating. One theory suggests that larger cells are making out honeybees more susceptible to these mites. The Fix Go natural by letting the bees build their comb (often referred to as going foundationless) or by using small cell foundation. It’s common to see deep boxes for brood and medium boxes for honey supers. Unfortunately, this means you’re now invested in purchasing two separate box and frame sizes for your beekeeping operation. This becomes even less convenient when you end up with a frame of brood in your honey super or a frame of honey in your brood box. Since the frames are of different sizes, you can’t simply move them from one box to the other. The Fix To fix this hive problem, use one size of box for everything. I’d suggest using medium boxes and frames. They’re lighter and easier to manipulate. The queen will happily use it for brood, and they more securely support foundationless comb. I especially like using one size of equipment when it comes time to make splits or nucs. I simply move a few frames of bee covered brood, pollen, and honey to an empty box and let them build a new queen. This is easy because I’m not dealing with multiple sizes of boxes or frames. Standard Langstroth hives are too big. Besides being uncomfortable to lift, they don’t over-wintering well. That’s because they have a hard time accessing honey in the outer two frames when they’re clustered together to stay warm. To explain why, remember that frames are filled with honeycomb and run parallel to each other – this geometry makes it easy for the bees to walk on the surface of each frame but difficult for them to move perpendicular through the frames. For a bee to go between two frames, it must walk up, over, and down. The Fix Use 8 frame boxes. 8 frame boxes are roughly the same width as an overwintering cluster of honeybees. As a result, we’ve eliminated much of side to side movement in the hive and have made each frame of winter honey more accessible. Other than a small hole in the inner cover, commercial langstroth don’t have a lot of ventilation. This isn’t as much of an issue in the summer but can keep your bees pretty quickly in the winter months. As the bees breath, they release warm, moist air. Unless the hive is well ventilated, this moist air condenses on the cool inner cover of the hive and freezes or worse, rains down on the bees. Wet bees are dead bees. The Fix Install a Warre Style Top-Quilt box to solve this hive problem. A Warre top quilt is a shallow box that sits on top of the hive and is filled with a bedding material such as straw, sawdust, or wood chips. The quilt box has a 1/8th-inch wire mesh bottom that separates the hive from the bedding material and prevents moisture from building up. Over time, the bees add or remove propolis from the mesh to regulate the airflow. The top quilt is ideal for overwintering bees, as it provides insulation from the elements while allowing moisture to escape the hive. Many commercial Langstroth Hives use a queen excluder to isolate the queen in the brood box and to prevent her from laying in the honey supers. Unfortunately, the excluder isn’t always effective as some smaller queens make it through anyway. Some honeybee colonies don’t like to cross it, fail to take advantage of the added room on the other side of the excluder, and swarm. The queen excluder also limits the size of the brood chamber and contributes to an increased likelihood of swarming. (2) adding an empty box just above the brood next. In this case, you’ve provided room for honey and or brood. If they fill it with honey, great! Add another box. If by chance the queen lays in it then they needed the space. Not a problem since you’re using a single size of equipment for everything. Repeat.